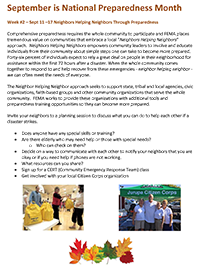 Do you live in a Mobile Home or RV Park or know someone who does? If yes, do you know that as part of your household earthquake plan you need to know where the piers and supports are physically located under your home so you can identify safe places to be in every room in an earthquake in case your home slips off it’s foundation and those piers and supports come up through your floor? The owner or operator of every mobile home and special occupancy park, regardless of size, must adopt an emergency preparedness plan. The owner or operator must post notice of the emergency preparedness plan in the park clubhouse or in another conspicuous area within the park. The owner or operator must provide residents with a notice on how to access the emergency plan and individual emergency preparedness information from state or local agencies. The Plan must be approved by the respective park enforcement agency (the agency that issues the park’s permits and performs inspections) in order to obtain the park’s annual Permit-to-Operate. This document is not itself an emergency preparedness plan, but is intended to serve as a model for use in developing individual park plans. The goal of the emergency plan is to reduce the risk to life, health, and safety of park residents and emergency services personnel. To ensure that all park residents can be evacuated in a safe and timely manner in an emergency, the plan should identify residents with disabilities and health issues that may need assistance during an evacuation. The plan should identify essential evacuation routes that will be used in an emergency situation. 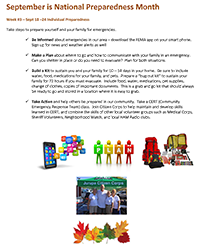 Residents must have access to the plan and information on individual emergency preparedness to enable them to take personal responsibility for themselves during an emergency. 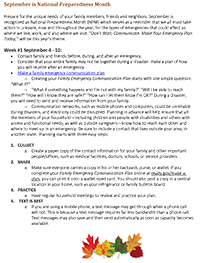 Please become familiar with your community’s emergency plan and take an active role in helping to improve and communicate its contents to your neighbors.